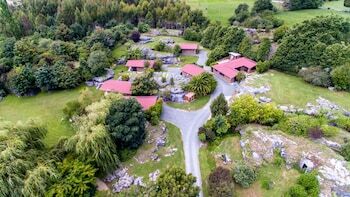 Located in Takaka, The Rocks Chalets is in a national park, a 1-minute drive from Golden Bay and 7 minutes from Kahurangi National Park. Featured amenities include luggage storage and laundry facilities. Free self parking is available onsite. Located in Kaikoura, Wacky Stays is in the suburbs, a 5-minute drive from Kaikoura Museum and 7 minutes from Mount Fyffe. Free self parking is available onsite. Located in Taupo, this vacation home is a 3-minute drive from Lake Taupo and 9 minutes from Barbary. Free self parking is available onsite.